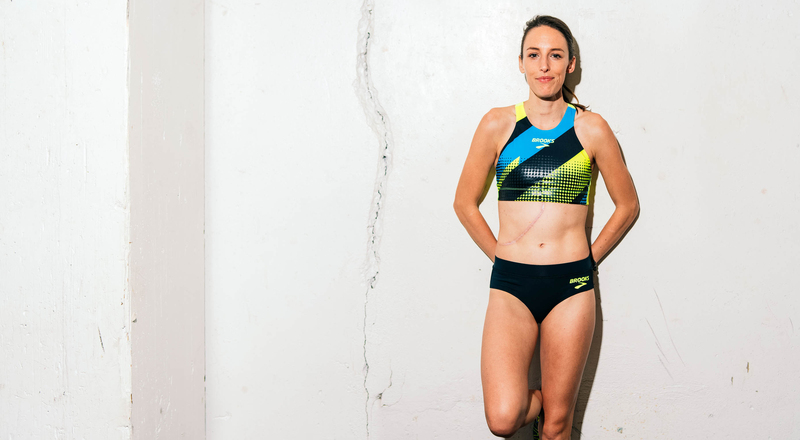 After being diagnosed with a rare cancer, professional runner Gabriele Grunewald became inspired to start a nonprofit that raised awareness for other rare cancers and empowered those who have them. Throughout her career as a professional runner, Gabriele (Gabe) Grunewald was always good at pushing through the pain when on the track. But the athlete faced her biggest adversity in 2009 when she received a phone call while at a track meet. It was her doctor calling to tell her she had cancer. At the time, Grunewald was 22 years old and wrapping up her time at the University of Minnesota when she found a small bump behind her ear. The athletic trainers were not too worried, but told her to get it checked out just in case. Grunewald had the bump biopsied and ended up receiving a diagnosis of adenoid cystic carcinoma, a rare type of cancer of the secretory glands that affects more than 1,200 Americans each year, according to the Adenoid Cystic Carcinoma Research Foundation. Grunewald had surgery and radiation that summer, and throughout her treatment, she made it a mission to keep running a major part of her life. This was even true after she was diagnosed with thyroid cancer in 2010; an adenoid cystic carcinoma recurrence on her liver in 2016, shortly after she ran in the Olympic Trials; and then more liver metastases in March 2017. Last summer, Grunewald was on an immunotherapy trial for combination therapy of Opdivo (nivolumab) and Yervoy (ipilimumab). But in October, a CT scan showed tumor progression. So, Grunewald’s treatment plan added a liver-director radiation therapy called TheraSphere. In January, scans showed that Grunewald’s tumors shrunk, so while she is no longer on the immunotherapy duo trial, she will start treatment with Opdivo again. To keep herself motivated to stay physically active, Grunewald focused on the abundance of recent research showing that physical activity can improve cancer outcomes. Not to mention, staying physically active was Grunewald’s way of reminding herself that her body did not betray her and she can still do amazing things — be it running a marathon or walking to the mailbox. Bringing empowerment, be it physically or knowledge-based, to patients with rare cancers is the driving factor behind the nonprofit organization that Grunewald founded, Brave Like Gabe. Grunewald established the organization so that people with rare cancers don’t feel the way she did when she first researched her type of cancer — terrified. Brave Like Gabe works to raise both funds and awareness for these diseases through social media and athletic events. One of the ways Grunewald plans to raise awareness is through the “My Brave Story” social media campaign, where patients and their loved ones are encouraged to post images of themselves doing something spectacular with the hashtags, #MyBraveStory and #BraveLikeYourNameHere. In fact, Grunewald explained that she has never met another person with her same diagnosis in person, but the internet and social media allowed her to make those connections that would have otherwise been impossible a few decades ago. “It’s a really powerful and interesting way for survivors to connect with each other, especially for rare cancers like mine. It definitely helps to share the journey,” she said. Next month, the organization will hold its first 5K race in Grunewald’s home state of Minnesota. Brave Like Gabe will also roll out its 1224 campaign — a race that will hopefully have 1,224 participants to represent the number of people diagnosed with adenoid cystic carcinoma each year in the United States. Looking at her athletic future, Grunewald continues to train with the ultimate goal of making it to the 2020 Olympics in Tokyo. “We’re just getting started, but we’re excited to get connected with the greater cancer community,” she said.